Posted By:Unknown | At:10:24 AM Be the first to comment! (CNN) -- Three days before Independence Day, Milton Hall died in a fusillade of police gunfire outside a strip mall. He had been arguing with officers in a parking lot next to a shuttered Chinese restaurant when he was shot, in full view of passing motorists and while he was holding some sort of knife. Saginaw County Prosecutor Michael Thomas said later that the squad of police confronting him opened fire "because apparently, at this point in time, he was threatening to assault police." Thomas' office and the Michigan State Police are investigating Hall's death. Saginaw Police Chief Gerald Cliff said Hall was "known to be an assaultive person" with "a long history" of contacts with law enforcement, "not only with police from our department but with the county." Hall's cousin, Mike Washington, acknowledged Hall had been jailed for minor offenses like vagrancy in the past, but, "He was not violent." 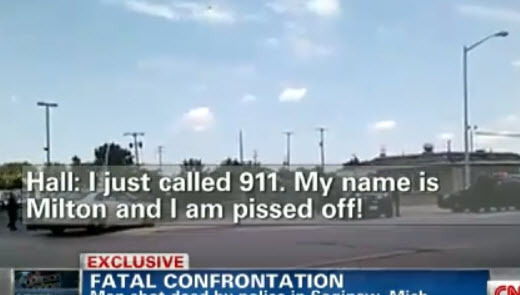 And Hall's mother is growing impatient with the probe and questions why police opened fire so furiously on her son, whom she said was mentally ill.
"It appeared to be a firing squad dressed in police uniforms," Jewel Hall told CNN from her hometown of Albuquerque, New Mexico. "There was another way. They did not have to kill him. He had not done anything. He was not violent. He was not a murderer. He was not a criminal." Jewel Hall said her son had once trained as a civil right activist, been an avid reader and played football. He had lived in Saginaw for 35 years and received Social Security disability payments for a mental illness, but, "He knew his rights." "Everybody knew him. The police knew him well," she said. "So that's another question: they knew him, so why? Why did they kill him?" The July 1 shooting happened in a parking lot on West Genessee Avenue, a busy commercial strip on the north side of Saginaw. In a video purchased by CNN, shot by a motorist from across the street, the 49-year-old Hall is seen arguing with a half-dozen officers. For more than three minutes, he walks back and forth, and at one time appears to crouch in a "karate stance," according to the man who captured the scene.